I am excited to share the news that there will be opportunities to see my original fabric-relief artwork in different parts of the country this fall and winter. The Pocketful of Posies exhibit, will be at the Upcountry Museum – Furman University in Greenville, South Carolina, Oct. 17, 2015 – Feb. 14, 2016. Next month I will head down to Greenville to give a talk about my work on Thurs., Nov. 19th at 7:00 pm. This is the last scheduled exhibit on the 5 year tour and I hope that many of you can make the trip to see the show! 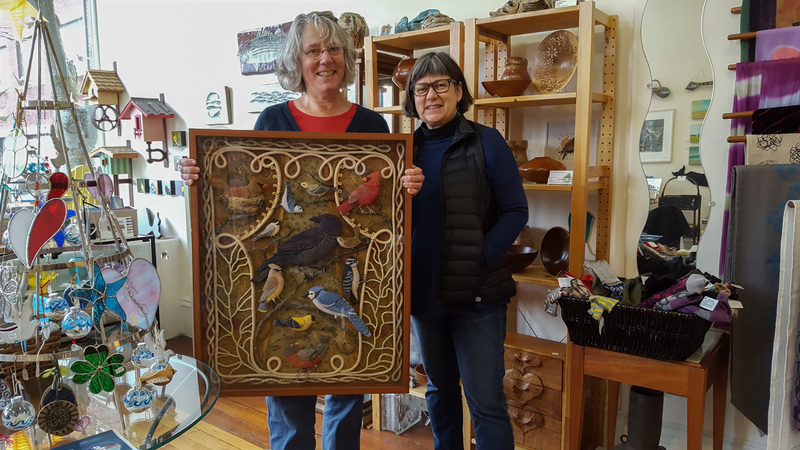 And, 2 of my larger pieces will be included in Insects to Elephants: Mother Nature’s Menagerie at the Wisconsin Museum of Quilts and Fiber Arts in Cedarburg, Wisconsin. Birds of Beebe Woods and Rabbitat will be displayed from Oct 21. 2015 – January 10, 2016. Also, my piece, FaceTime is part of the group show, Entangled at Some Things Looming in Reading Pennsylvania until Oct. 24th. The Birds and Rabbits seem to travel together as a pair these days. 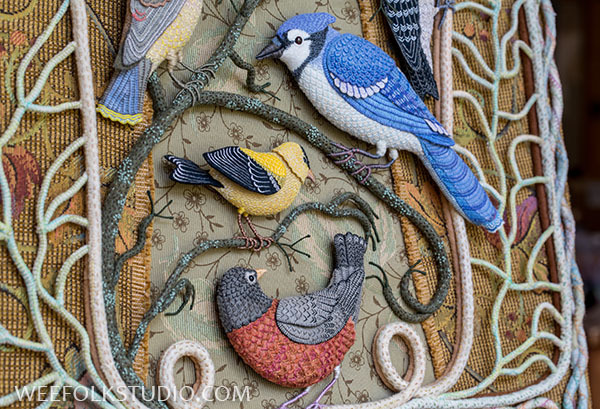 Ok, I’m talking about my two fabric relief pieces, Birds of Beebe Woods and Rabbitat. 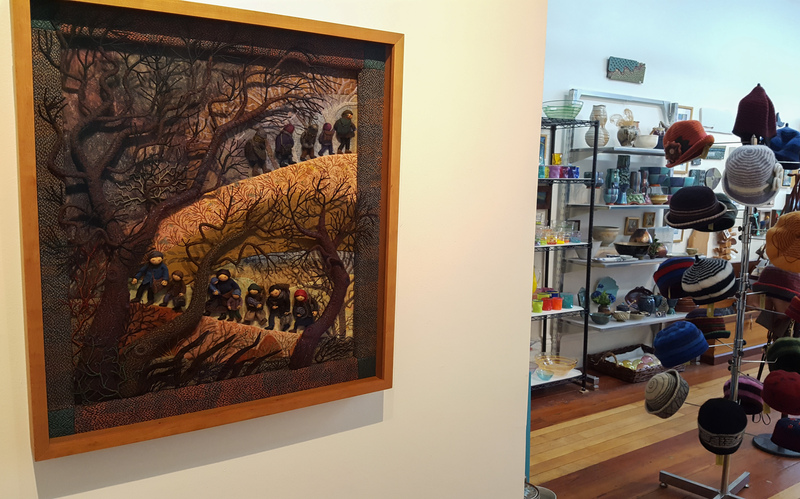 They were at the Chandler Center in Arizona last fall and now, they are part of Fiberworks Plus at the Cahoon Museum, Cotuit, Massachusetts until April 19th. I’m happy that they are being displayed out in public, so that more people can see them. That’s the primary reason I’m not selling them. Posters are available from my Etsy Shop. 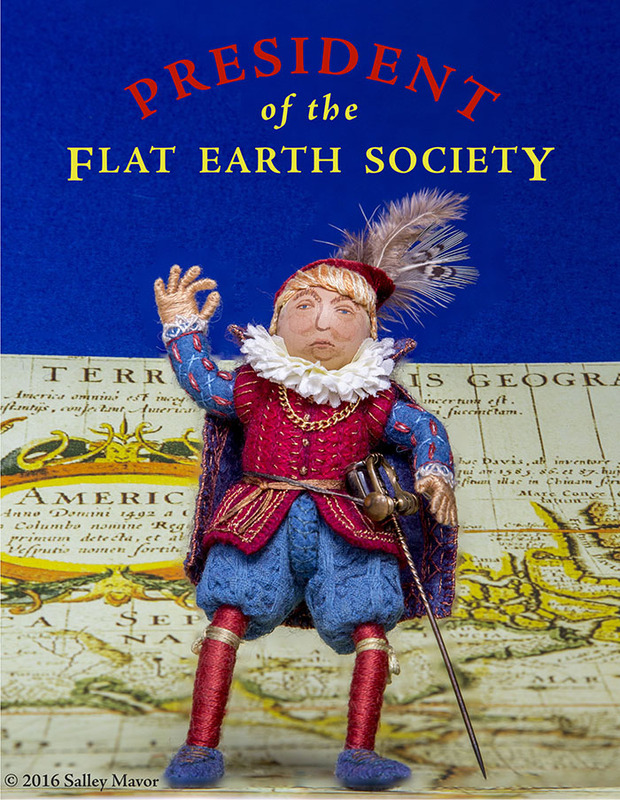 For those of you on or near Cape Cod, I will be giving a talk at the Cahoon Museum on Tuesday, March 24th at 11;00 am. The museum is undergoing renovations, so the exhibit and my talk will be in their temporary location in Mashpee Commons. The two pieces will be traveling together again later this year, when they go to Winconsin, Oct 21. 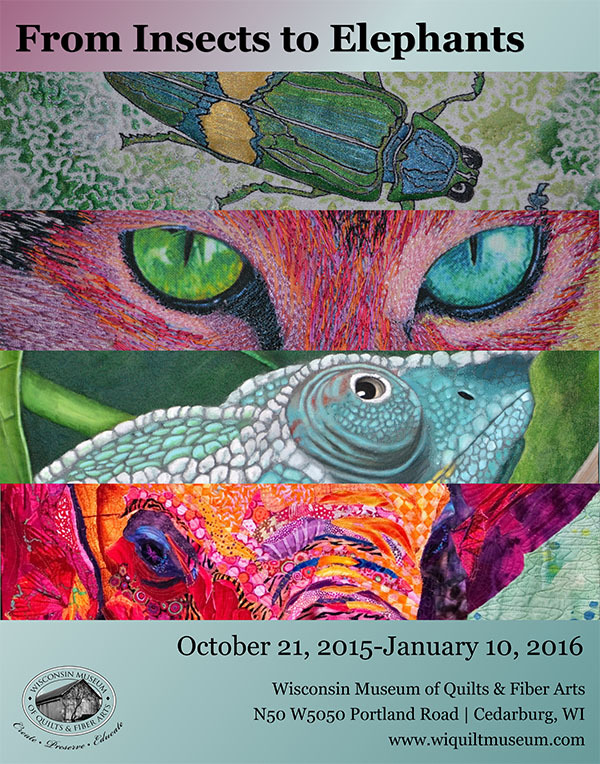 2015 – January 10, 2016 for Insects to Elephants at the Wisconsin Museum of Quilts and Fiber Arts in Cedarburg, Wisconsin. Look what came in the mail today! 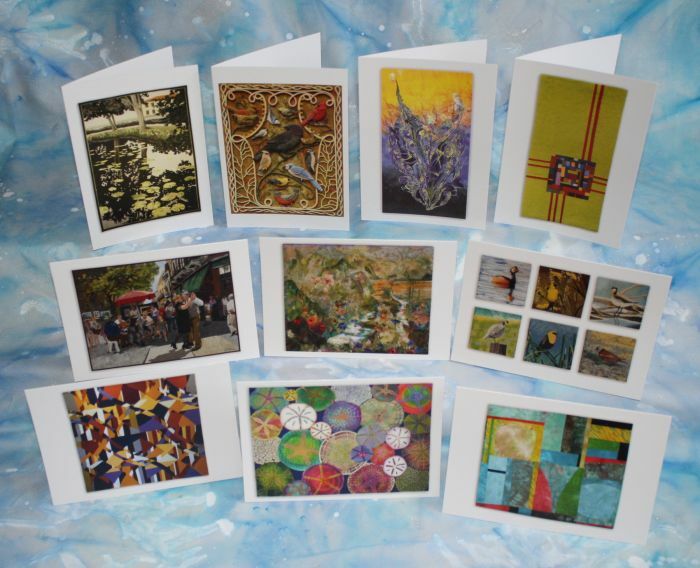 A pack of note cards that feature the unique works of SAQA (Studio Art Quilt Associates) Professional Artist Members. 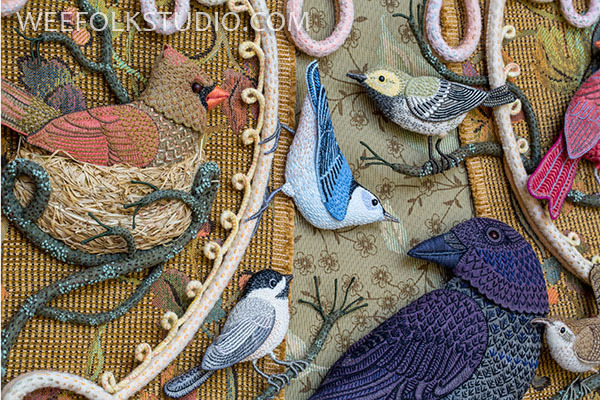 10 art quilts are in the set, including my Birds of Beebe Woods piece. I feel honored to have my work selected for this collection, which represents the broad range of styles and techniques identified as “art quilts”. Card sales will benefit SAQA and are sold at a very reasonable price on their website here. 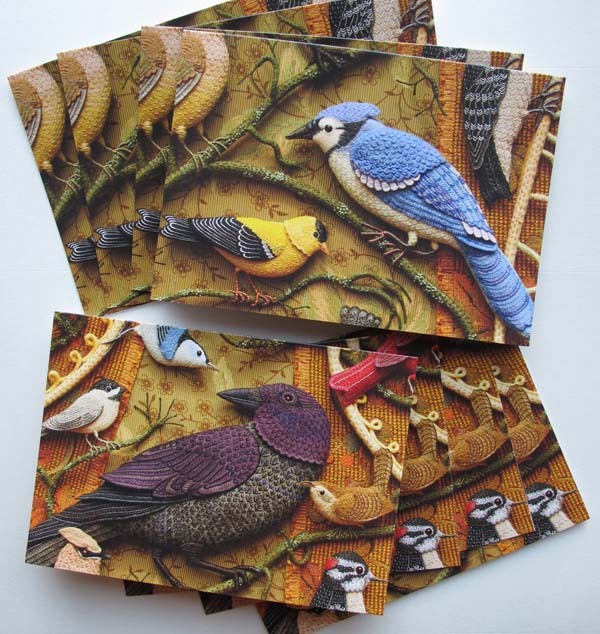 Just as a reminder– I sell cards as well and have 2 detailed images from Birds of Beebe Woods (shown below) in my Etsy Shop here. 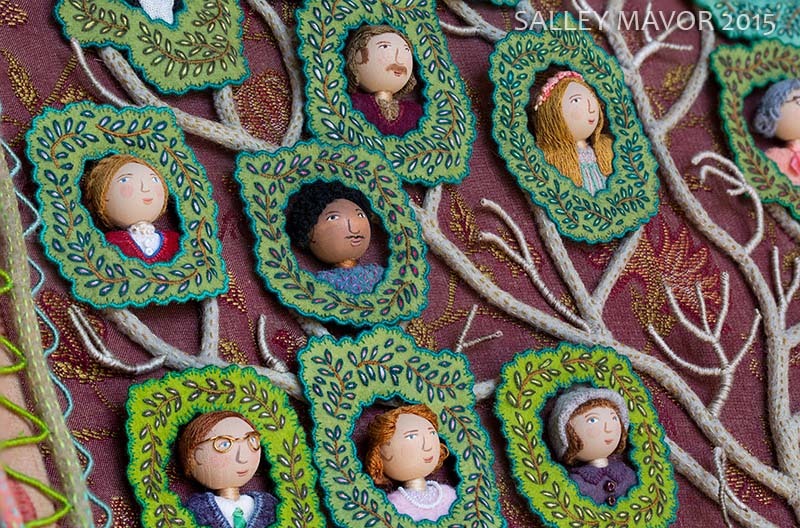 July 4 – August 16, 2014 ~ Salley Mavor: Expressions in Stitches: Then and Now Falmouth Museums on the Green, Falmouth, MA. 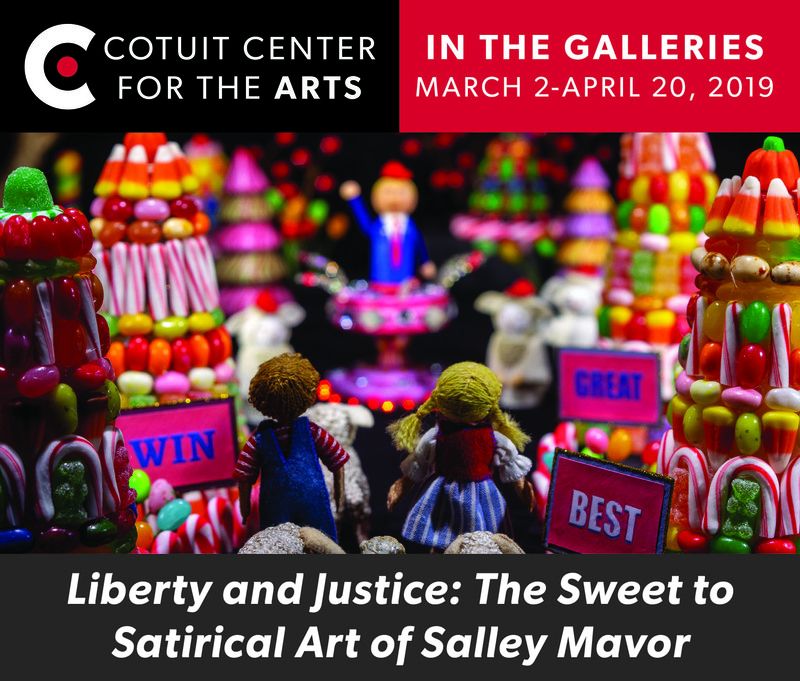 Historical needlework from the museum’s collection will be exhibited alongside the contemporary embroidered artwork of Salley Mavor. Sat, July 19th – “Tea at the Museum” and Artist Talk – 1:00 -3:00 pm. 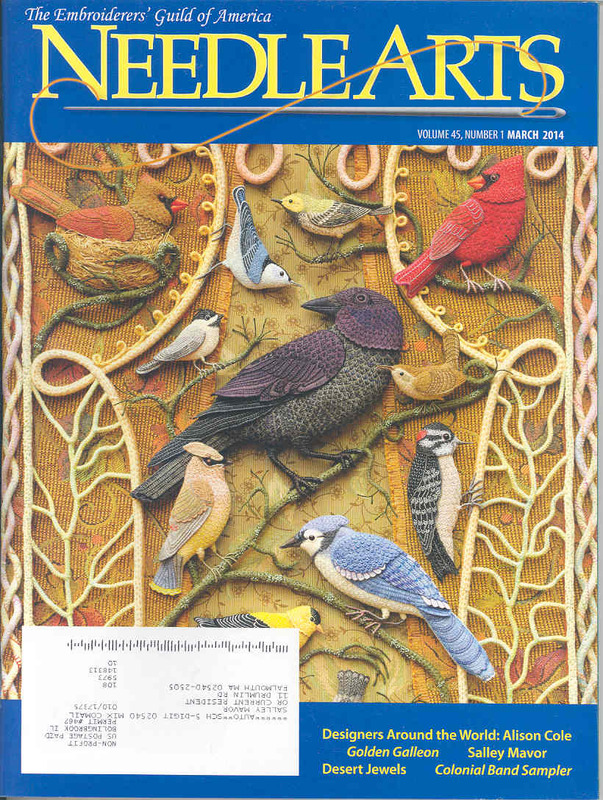 I returned from our trip to Cuba (see posts here) to find my Birds on the cover of the March issue of the Embroiderer’s Guild of America’s Needle Arts Magazine! Of course, I knew about the article, but I was unaware that my piece would be on the cover, so it was a nice surprise. Thank you, Shirley Wozena, for describing my work so well in the article. Mary Corbet’s Needle N’Thread blog has a post about this issue and EGA in general. 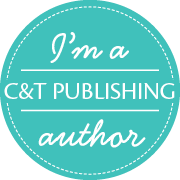 It is gratifying to know that many of the magazine’s readers have been introduced to my work for the first time. The article shows photos of the process of making the Birds of Beebe Woods, which are some of the same pictures I’ve shared on this blog. 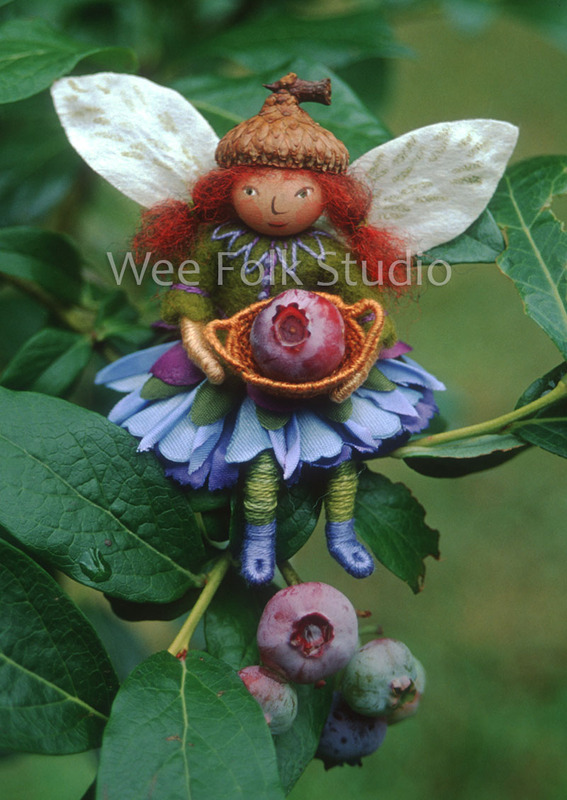 I’ve heard from people who want to know if I have instructions or a kit to make their own. Embroidery and needlework has a strong tradition of copying and learning from patterns and directions, so it’s a natural assumption that I would share my techniques. I’m glad that embroiderers are inspired to learn more, but honestly, I can’t imagine revisiting this piece like that and writing out detailed directions. Yes, I post photos of general steps along the way and have written how-to instructions for the dolls in Felt Wee Folk, but it only goes so far. For instance, in the past, some have expressed frustration that I haven’t shown detailed instruction on how to form hands and fingers. 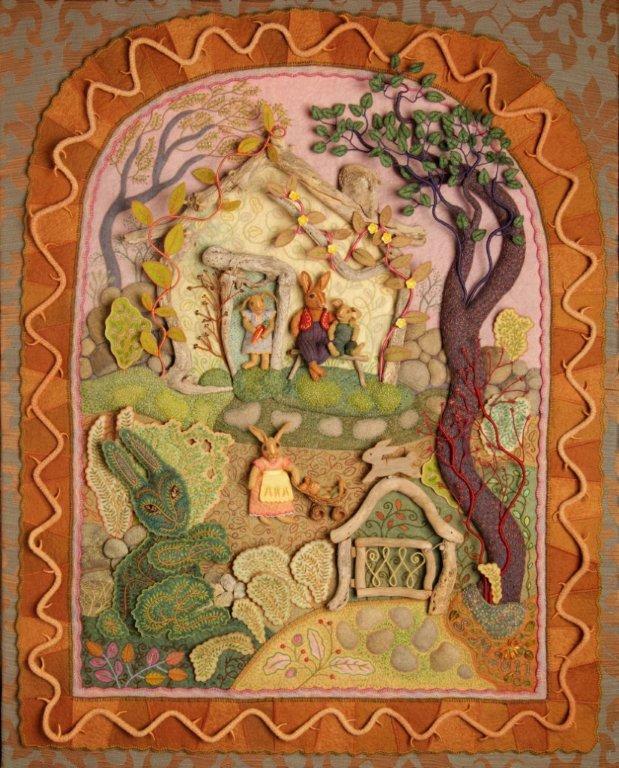 My answer is that I consider the more involved process of making my fabric reliefs a proprietary personal expression that I’m not sure I can explain effectively anyways. My work requires a non-analytical approach that I don’t want to tamper with. For me, recounting the process would be going back in time, instead of moving forward. And, I don’t want to ruin the magic, because that’s what keeps me excited about making the next piece! This month has been an embarrassment of riches, in the magazine department. Because of postponements, it just happened that everything came out in March. 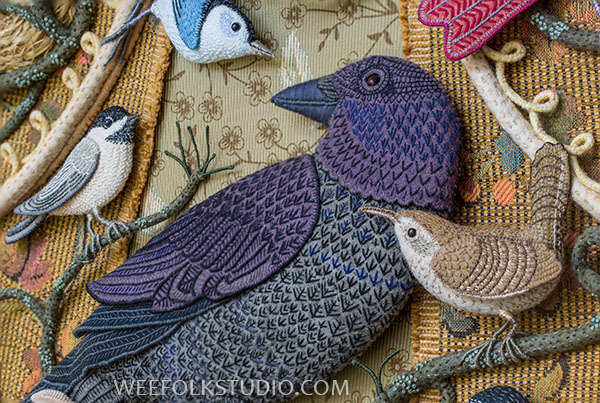 In addition to Needle Arts, there was the Cape Cod magazine profile. 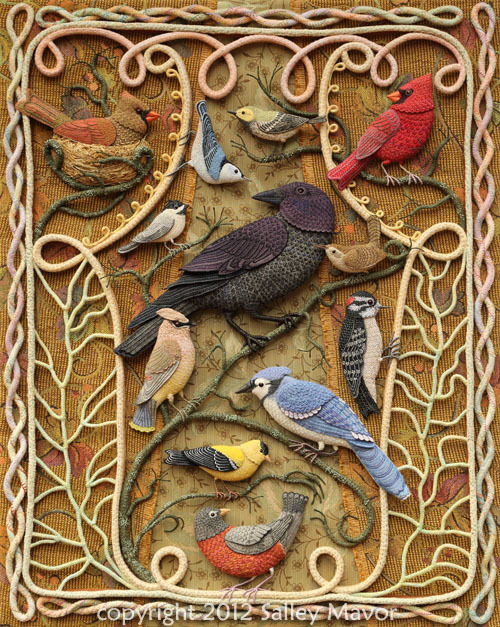 The Horn Book Magazine has my essay, “The Common Thread” in their March/April illustration issue and Fiber Art Now has included my Birds piece in their On View feature. 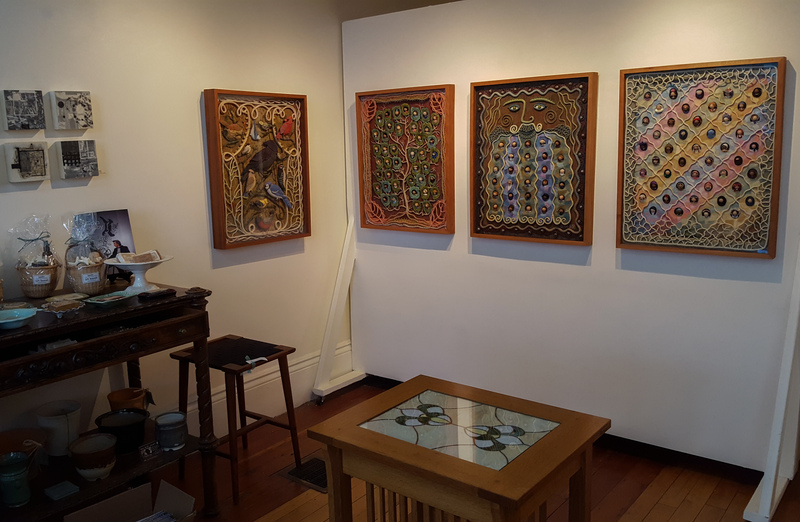 The Birds of Beebe Woods is currently on display at Artworks in New Bedford, MA. It’s part of the Fiber in the Present Tense exhibit, which runs through March 29th. If you get there, please be aware that Gallery 65 on William is just around the corner, where 28 original illustrations from Pocketful of Posies are being shown, (hours: W, T, F, S 11:00 – 5:00). I will be out of town and won’t be able to attend their openings, which are both on Sat., March 8th from 3 – 5 pm. But, I will be giving a lecture at the closing reception for the “Posies” exhibit at Gallery 65 on William on Sat., March 29th, 3 – 5 pm. I hope to meet some of you then!